Naval Officer John Gay could see the fighter plane drop from the sky heading toward the port side of the aircraft carrier USS Constellation. At 1,000 feet, the pilot drops the F/A-18C Hornet to increase his speed to 750 mph, vapor flickering off the curved surfaces of the plane. In the precise moment a cloud in the shape of a farm-fresh egg forms around the Hornet 200 yards from the carrier, its engines rippling the Pacific Ocean just 75 feet below, Gay hears an explosion and snaps his camera shutter once. "I clicked the same time I heard the boom, and I knew I had it," Gay said. What he had was a technically meticulous depiction of the sound barrier being broken July 7, 1999, somewhere on the Pacific between Hawaii and Japan. Sports Illustrated, Brills Content, and Life ran the photo. The photo recently took first prize in the science and technology division in the World Press Photo 2000 contest, which drew more than 42,000 entries worldwide. "All of a sudden, in the last few days, I've been getting calls from everywhere about it again. It's kind of neat," he said, in a telephone interview from his station in Virginia Beach, Va. A naval veteran of 12 years, Gay, 38, manages a crew of eight assigned to take intelligence photographs from the high-tech belly of an F-14 Tomcat, the fastest fighter in the US Navy. In July, Gay had been part of a Joint Task Force Exercise as the Constellation made its way to Japan. Gay selected his Nikon S 90, one of the five 35 mm cameras he owns. He set his 80-300 mm zoom lens on 300 mm, set his shutter speed at 1/1000 of a second with an aperture setting of F5.6. "I put it on full manual focus and exposure," Gay said. "I tell young photographers who are into automatic everything, you aren't going to get that shot on auto. The plane is too fast. The camera can't keep up." At sea level a plane must exceed approx. 741mph to break the sound barrier, or the speed at which sound travels. 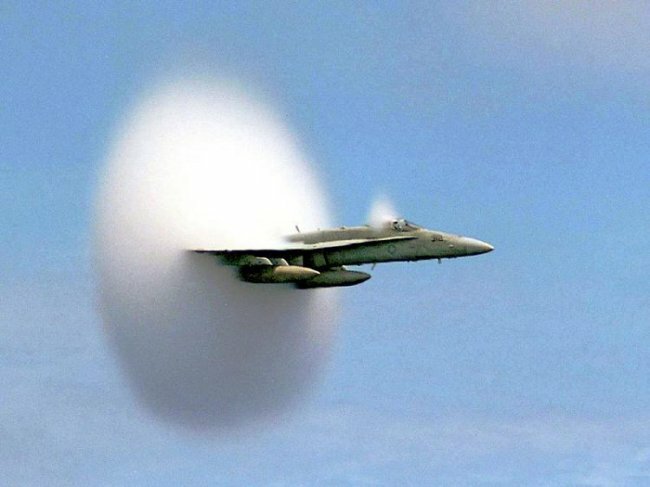 The change in pressure as the plane outruns all of the pressure and sound waves in front of it is heard on the ground as an explosion or sonic boom. The pressure change condenses the water in the air as the jet passes these waves. Altitude, wind speed, humidity, the shape and trajectory of the plane-all of these affect the breaking of this barrier. The slightest drag or atmospheric pull on the plane shatters the vapor oval like fireworks as the plane passes through. He said everything on July 7 was perfect. "You see this vapor flicker around the plane that gets bigger and bigger. You get this loud boom, and it's instantaneous. The vapor cloud is there, and then it's not there. It's the coolest thing you have ever seen."